For as long as our protagonist Serena (Reena) can remember she’s always liked Sawyer LeGrande. Sawyer is the good looking and charming boy who one way or another has always been in Reena’s life. Yet he hasn’t really noticed her - so she thinks. Until One day he does and thus begins a crazy relationship neither ever imagined, the result; a 16, helpless, Sawyer-less and Pregnant Reena. Split into a before and after narrative (Before pregnancy, after pregnancy), How to Love is a story of family, love, self-discovery and forgiveness. 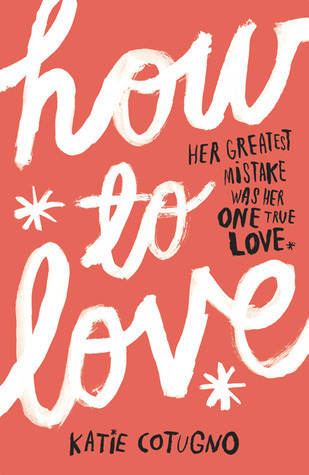 How to Love is emotional, and deeply moving. I couldn’t put it down! I'd heard bad things but I’d also heard really really good things and I ended up falling on that side of the spectrum. How to Love was the first book I picked out for Christmas and to say I was looking forward to it would be somewhat of an understatement. It’s always worrying when you come into a book with high hopes because it in a way alters your reading experience but fortunately for me, that wasn’t the case. I don’t know why but I felt as though How to Love would be my sorta book and it was. Serena could sometimes be a bit of an Ice Queen (as she would say) but she was a very memorable and honest character. Sure she had flaws, I mean for god sakes Sawyer LeGrand was practically her kryptonite. She did stupid things sometimes without thinking and she made plenty of mistakes. But in the end she was real. These flaws somehow made Reena more human and more relatable than most characters. The relationships in How to Love were beautifully done. Reena’s relationship with her daughter was heart-warming and one of the things I loved best about the story. I loved Reena’s friendship with Shelby, she was such a supportive and caring friend but she also had this no nonsense attitude about her. It was interesting to see the problems which the pregnancy and Reena’s relationship with Sawyer caused her bond with her family and we closely see that in the after section. Reading in the perspective of a teen mom it could have easily been another episode of MTV’s ‘Sixteen & Pregnant’ but instead it was deep, original and realistic. I’ve been saying the words ‘realistic and real’ a lot but I loved the realness of the story. It didn’t shy away from struggle and heart-ache and it dealt with these mature themes very well. Sawyer and Reena had such a strong love for eachother which was both a good thing and a bad thing at times. Their relationship was full of disagreements and problems and if one word was to describe it, I’d chose messy. Yet somehow I feel as though Reena is the only person who could ever deal with Sawyer. I felt like even though their love was dysfunctional it was also too strong to let go of. That’s not to say at times I didn’t want to punch Sawyer or tell Reena to think and remember what he’d done but that’s just the reality of their relationship. I thought that the before and after chapters and the time they took place really benefited the story. They worked really well together without causing much confusion or spoiling things. I immediately found myself engaged in Reena and Sawyer’s love story. I couldn’t and didn’t want to put it down. Having been in a semi slump before-hand, I found it so elating to be able to get stuck into the story and become so involved with the characters. How to Love was what I would call, a unforgettable debut. It’s quickly become one of my favourite reads of 2013 and I’ll be recommending this to you guys a lot. I think it’s no surprise I’ll be giving this 5/5 stars. And I love how their love was very believeable and was still there after three years. Like you said, dysfunctional love but strong. The relationship was done beautifully! I didn't like Reena for parts of the book though, I felt she was being a bit selfish sometimes but harsh to Sawyer.. but Sawyer was no angel either :3 I guess that makes their personalities more realistic and refreshing. I'll be writing my review soon :) Thanks for sharing, Sunny! Fantastic review! This sounds like a really good book. I'm going to have to borrow it off you one day.